Pinksummer: We found an odd article on “The Observer” newspaper (May 2013) titled “Brother, Can you Spare $ 2 Billion? 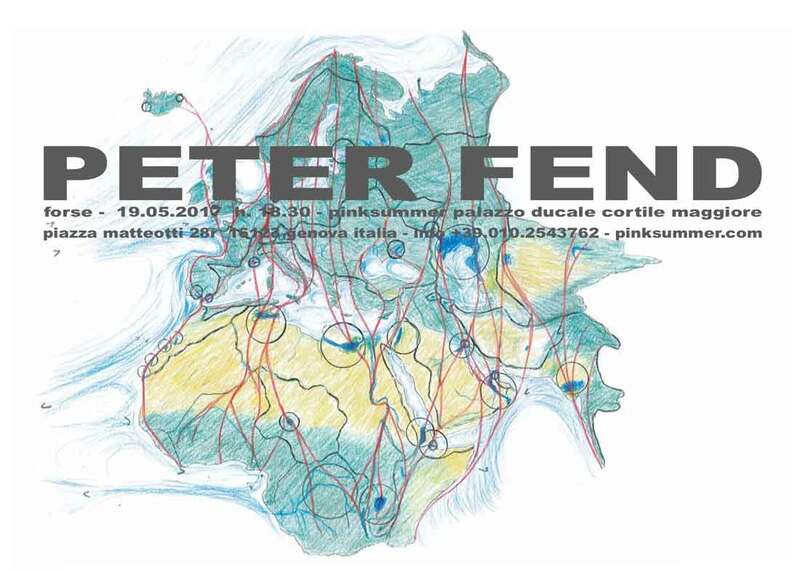 : Is Artist Peter Fend an Autodidactic Genius or a Globetrotting Gadfly?”. It starts like this: “Who is Peter Fend? ‘The Buckminster Fuller of The New Wave’, art critic Alan Jones suggested in an article 20 years ago. ‘The Lawrence of Arabia of the art world’, Mr. Fend’s old collaborator, the artist Richard Prince, opined in the same article. We like the idea of comparing you with Tristram Shandy for multiple reasons, first of all for what concerns digression and metanarrative. Across our year long epistolary exchange (via e-mail) with you, we saw often art turning from a primary topic into a secondary one. You made us a bit confused, if not utterly shaken up, by taking us for a walk between reality and dreams , dealing with politics, environment, History and stories… Sometimes the Here and Now seems to get out of hand, but you are not a dreamer. Also Laurence Sterne’s novel is the anxious product of the Britain that was storing in the attic all values of rural life in order to enter, before anyone else, the age of urban sprawl and human alienation of industrial revolution. In terms of foreign policy, it was creating its enormous colonial empire, based on the exploitation of people and environmental resources. We fear that Britain, that is now negotiating with complacency its exit from the dream of Europe, which it never really shared, can anticipate all the others again, with its enclosure in its own national borders, in spite of any idea of integration and free movement. Peter, did you ever think that all your projects “Unbuilt Roads” and “TO BE BUILT” would eventually be crushed by the size and sterngt of the opposition and therefore be useless? Peter Fend: I have a two-sentence answer. We should restore pre-Neolithic numbers of wild animals. In most cases, this requires on-site work. Ps: Neolithic has been revolutionary regarding environment. Do you think the process could be reversible? Pf: It’s reversible because we have enough scientific knowledge now, plus paradigms from Earth Art, pioneers like Beuys and Duchamp, and urgent political-demographic pressures, to compel the return to pre-domestication land use. Good places to start are the US Great Plains, Central Asia, Mato Grosso in South America and Africa. Ps: We quote you “1976 ‘Agriculture Ends, Art Takes Over’. This, followed by “Evolution Mediation” and a letter to Dennis Oppenheim on his return to ‘the wild’, introduces me to the NY art world. Am nicknamed ‘Dr.Fang’, run with deerskin and javelin to extol hunting-fishing-gathering as against farming; get noticed by Gordon Matta-Clark, who asks me to scout out technologies, e.g., balloons and bridge engineering, for what would be an entirely-new architecture. Impassioned by lectures of Vincent Scully on “Garden & Fortress: The Shape of France,” I draw out a sequence of earthworks by DeMaria, Nauman, Oppenheim, Smithson, Heizer, within paradigms of Schneemann, Edelson and Horn, led by the ‘Chief of the Hunters’ Joseph Beuys, within rules and territorial limits defined by Duchamp, for an entirely new use of terrain. The drawings, ‘Earth Net: An Economic System’, appear at Caltech’s Baxter Art Museum. Similar views now in books like “Water: A Natural History,” saying that North America needs 80 million buffalo, 250 million beaver, billions of prairie dogs, and 25 million alligators. A University of Minnesota study concluded that 400 million humans here could live well on a native-American economy, with mostly hunting-fishing-gathering and only small-plot (or urban) farming. These are my central aims”. Technology and Science have been developed thanks to Neolithic demographic transition. new jobs must be created. Yes, to restore what we did for most of human existence: hunting, fishing, trapping, gathering. Robots can work in the factories and offices. I don’t deny population reduction (having done my part, with only one child, at 52, and the only child of four grandparentsv, and you promoted this too. We can do a dialectic. This is the reason I’ve risked to make many examples of “Cielo”, or Television Government. There, the pressure is very strong to reduce land imprint, hence number of humans. Ps: what will you present at pinksummer? Italy has teamed up with Monaco and Palau to re-direct the United Nations towards management, and gainful use, of the No. 1 necessity of the Planet: its Oceans. Making this move, Italy—along with Monaco and Palau—challenge the land-based strategies of several UN Security Council member-states, especially China. China works hard to surpass the West in its five centuries, since Christopher Columbus discovered America, of colonial empire. So, China builds dams, exports nuclear reactors, extracts minerals and crops, builds fast trains and aircraft, and seeks control of global logistics, all in a nationalist zeal to out-West the West. Destruction of the planet accelerates. Italy can break this fast & furious chase, launching an even faster and furiouser campaign, launched in where global empires of today started: Genova. The continent in question is not Europe alone, but Europe together with a vast terrain of which it is ecologically a part: Africa. Eurafrica is what I am talking about. China has its own plans for Africa, based on the colonial borders, the colonial practices of divide & conquer. Italy can have entirely new plans for Africa, based on its slopes to salt seas, based on a sine qua non for life: water. What Genova can do in its own Gulf, what it can do for Italy, and what huge changes it can effect in Europe together with Africa, extending from the Arctic to Antarctica, and back, gets displayed in a 10 m x 8 m space, and gets explained, in terms of methods of government, in an office of 6 m x 3.3 m.
It is an exhibition of ecological engineering, even though Fend has been described as a dreamer and utopian just because it takes a huge amount of money to make all that happen.